What Did "Automatic" Mean To The Futurists of Yesterday? 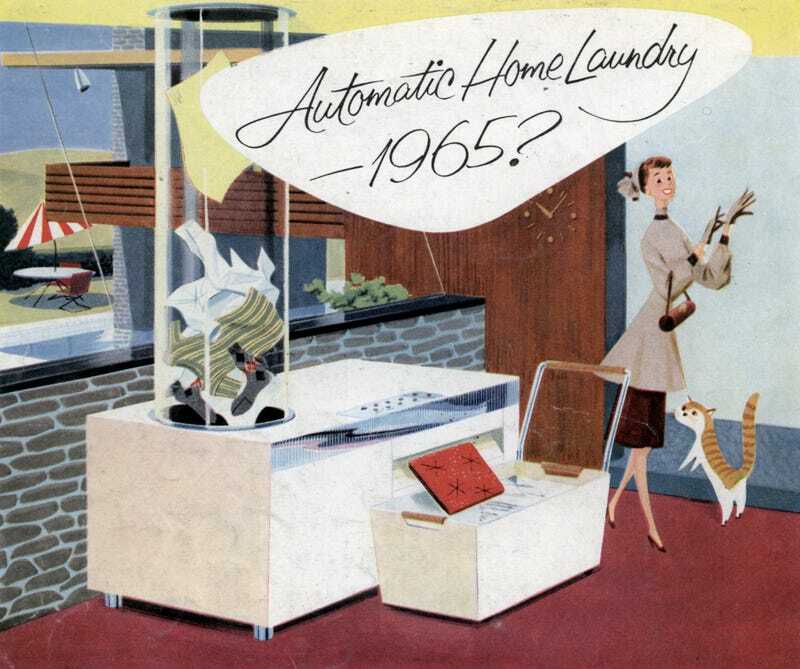 Of all the buzzwords of the retrofuture, nothing tickled the imagination of midcentury Americans quite like "automatic." Sure, the word pops up here and there in 1930s advertisements for things like the house of the future. And the word was incredibly popular during the rise of the push button at the turn of the 20th century. But it wasn't until after World War II that the word really kicked into hyperdrive. Cooking was going to be automatic. Highways were going to be automatic. Even building those highways was going to be automatic. But strangely, no one ever bothered to define the term. Like any good buzzword being repeated incessantly, "automatic" came to lose any semblance of meaning for a lot of people. It was simply the word you used when you wanted to invoke a sense of The Future™ and no other word would do. By the mid-1950s the United States had become an economic powerhouse, finally recovering from the recession that would follow World War II. And advertisements for consumer goods of the era included automatic everything. The January 1955 issue of Scientific American (found over at the lovely Modern Mechanix blog) included this ad for New Departure ball bearings. The ad promised that thanks to New Departure ball bearings, the drudgery of doing laundry would become a thing of the past. Automatically. The contraption we see in this midcentury illustration surpasses any machine that we have even here in the 21st century. Not only does it wash and dry in a single machine, this automatic laundry even irons and folds, dropping your fresh clothes directly into a mobile carrier presumably for delivery to your bedroom closet. Maybe it's hard to image a home laundry that washes, dries, irons, folds. But it's even harder to imagine this wonder — or any other — working without ball bearings... New Departures. Why this confidence? It's a matter of living up to a name. It means being first with new departures — like the Sealed-for-Life ball bearing. And New Departure will be ready tomorrow with the finest bearings... first! As we've looked at before, there's considerable debate among historians about just how much time and effort was truly saved by the domestic labor-saving machines of the 20th century. Sure, women (and it was largely women doing the housework) would be able to save an incredible amount of time scrubbing floors and doing laundry. But the time saved was offset in many cases by an evolving standard of cleanliness, which meant more time cleaning. All the "automatic" (again, not a very clearly defined word by anyone) machines that were helping to keep the home of the 20th century clean were being used more and more often to keep pace. It was no longer acceptable to see the tiniest amount of dirt on your floor or to only wash your clothes biweekly.